With the completely newly developed SLK, one of the most exciting and successful sports cars ever built is entering its third generation. The new roadster uncompromisingly takes driving pleasure and open-air enjoyment to a new level. It blends light-footed sportiness with stylish comfort, a striking sports-car design with total suitability for everyday use, top performance with exemplary ecology. 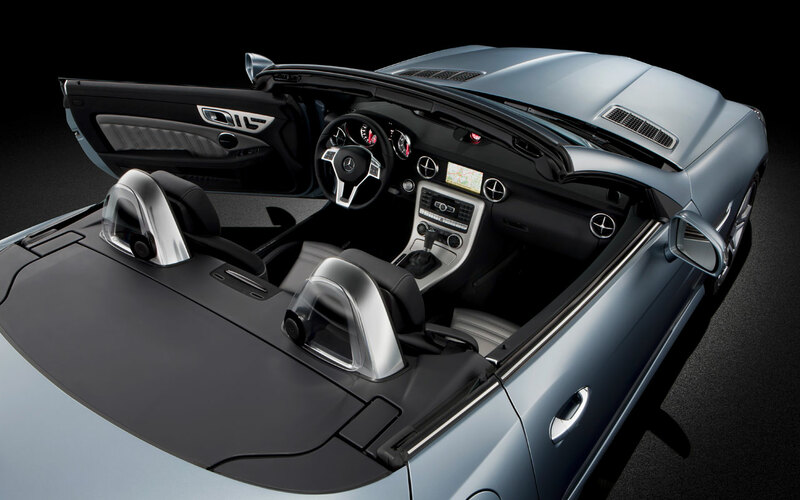 What’s more, the SLK is proud to present the world premiere of the panoramic vario-roof with MAGIC SKY CONTROL, which switches to light or dark at the touch of a button. Exemplary efficiency and sporty flair come courtesy of powerful new 4- and 6-cylinder engines featuring the standard-specification ECO start/stop function. With their superb levels of performance, they are up to 25 percent more economical than their predecessors. With a unique set of safety equipment and a wealth of technical innovations, the SLK is once again the benchmark in its class. 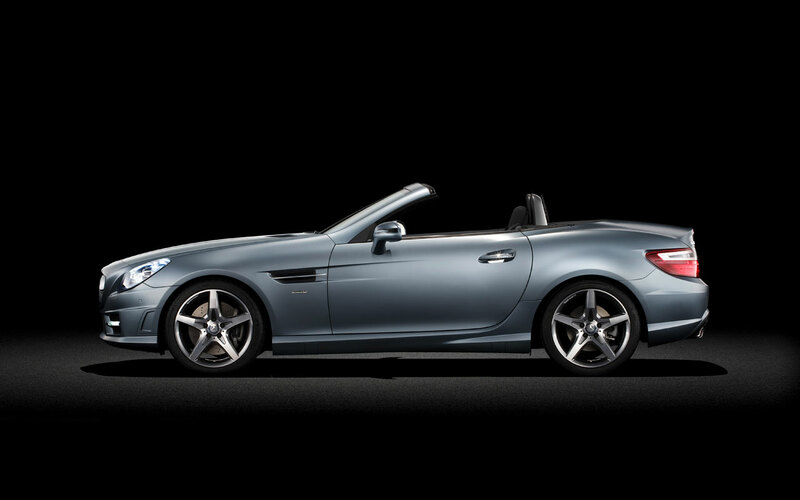 But the new Mercedes-Benz SLK offers more than merely individual highlights. It assumes a leading position in every discipline and offers fun at the wheel in every respect, with no half-hearted compromises. It impresses with characteristics which are generally deemed to be irreconcilable: it succeeds in uniting excellent comfort and high-quality equipment and appointments with a decidedly sporty flair, for instance. At the same time the new roadster is the most economical and thus the most environmentally friendly in its class, also setting new safety standards. And all-weather driving enjoyment – open and closed, in leisure-time and everyday use – is firmly anchored in the SLK’s genes. The designers have tailor-made an outfit for the new SLK which emphasises its classic roadster proportions and puts them in the spotlight to thrilling effect. Behind the long bonnet is a compact passenger compartment positioned far back, and a short tail end. The SLK will tempt potential customers with the key attributes that characterise all the classic roadsters from Mercedes-Benz and that have also made many of them automotive icons. The first feature to catch the eye is an upright radiator grille that stands proud and confident in the wind. It facilitates the long and well-proportioned bonnet and with its rearward light-catching contours it already hints at the roadster’s dynamic qualities. The wide radiator grille bears the Mercedes-Benz star in a prominent central position and displays a powerfully contoured fin, chromed at the front. 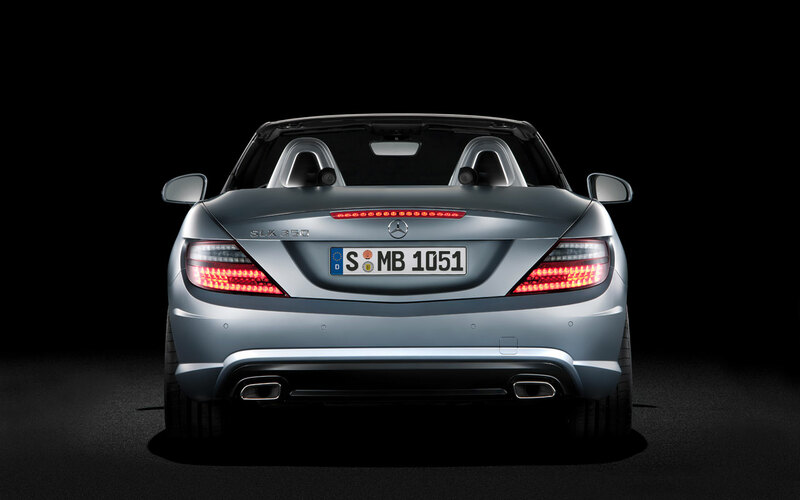 The clearly defined headlamps complete the look for the new SLK’s face, which resembles that of the legendary 190 SL from the 1950s, which is regarded by many as being the original “SLK”. But it was certainly not just the past that the designers were focusing on; with the new SLK’s front end they also intentionally created a close visual link with the new Mercedes-Benz SLS AMG “gull-wing model” and the new CLS. The amazing and measurable proof of the meticulously detailed work that has been carried out is that in spite of the more striking, steeper front and the larger frontal area, the Cd value has been cut to just 0.30 – a brilliant achievement (the preceding model’s Cd value was 0.32). The closed, elegant shape of the side view with the classic roadster proportions quickens the pulse and is a visual promise of the sportiness and driving pleasure in store. Fine details show the care that has been taken by the Mercedes-Benz designers. For example, a fillet conceals the boot joint, so that it does not disturb the side aspect as with similar roof designs. The ventilation grilles in the front wings with a chromed fin are reminiscent of the famous Mercedes-Benz roadsters of the 1950s. In the new SLK they form the perfect starting point for a feature line which flows to the muscular rear wing, using light and shadow to add style and elegance to the sides. Meanwhile the upper edge of the wide headlamps – which boast all-LED technology for the first time – also appears to flow into the feature line. There will initially be three models of the SLK available at its market launch, all of them powered by new engines with direct injection. The four-cylinder engines in the SLK 200 BlueEFFICIENCY and SLK 250 BlueEFFICIENCY develop 135 kW (184 hp) and 150 kW (204 hp) respectively from a displacement of 1796 cubic centimetres. 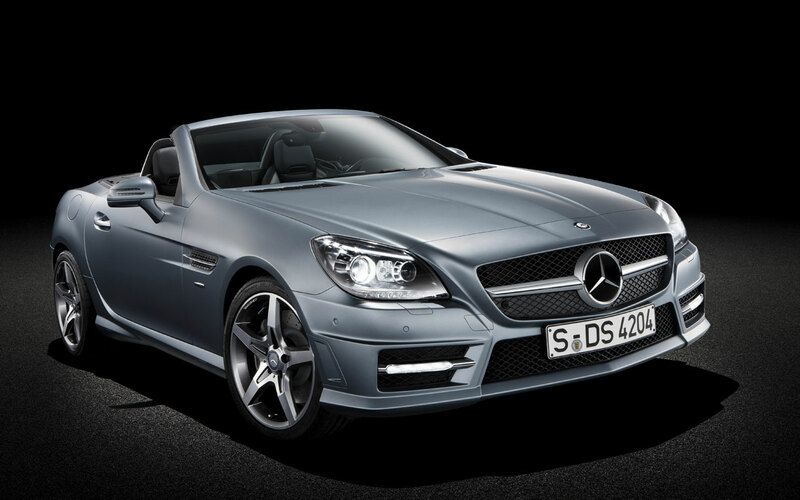 The SLK 200 BlueEFFICIENCY has the lowest CO2 emissions in its segment. With the enhanced, optional seven-speed automatic transmission 7G-TRONIC PLUS it consumes just 6.1 litres of premium petrol (NEDC, combined) over 100 kilometres, corresponding to 142 g of CO2 per kilometre. This sporty model sprints from 0 to 100 km/h in 7.0 seconds, and achieves a top speed of 237 km/h (240 km/h with manual transmission). The SLK 250 BlueEFFICIENCY is initially equipped with the 7G-TRONIC PLUS automatic transmission (a six-speed manual transmission will become available at a later date) and consumes only 6.2 litres (NEDC, combined) per 100 kilometres (144 g of CO2 per kilometre). From standstill it reaches 100 km/h in 6.6 seconds, and it has a top speed of 243 km/h. The V6 engine in the SLK 350 BlueEFFICIENCY generates 225 kW (306 hp) from its 3498 cubic-centimetre displacement, using this power to accelerate from 0 to 100 km/h in 5.6 seconds (top speed 250 km/h). Its consumption is 7.1 litres (NEDC, combined) per 100 kilometres (167 g of CO2 per kilometre). The V6 engine has been completely newly developed. Its most important hallmarks are 3rd-generation direct injection, piezo injectors and multi-spark ignition. The exemplary efficiency, with fuel consumption reduced by up to a quarter compared to the preceding model, is also due to the ECO start/stop system which is fitted as part of the standard specification in all models.